Back in 2015, General Mills gave Lucky Charms marshmallow fans a chance to win one of ten cereal boxes filled with just Lucky Charms marshmallows. This year, they're increasing the amount of boxes given out to 10,000. The "Lucky Charms Marshmallow Only Sweepstakes" runs through the end of the year and you can enter with a code from inside specially-marked Lucky Charm cereal boxes (pictured left) which can be found at retailers nationwide. 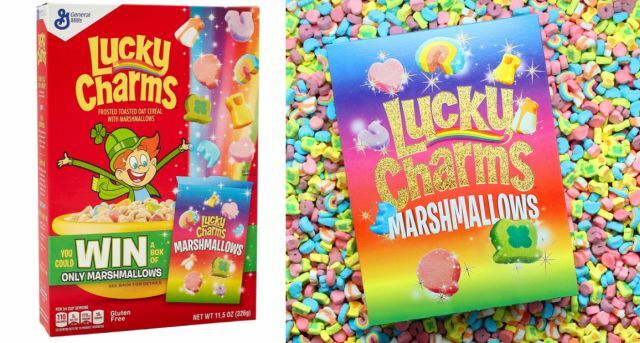 If you have a winning code, they'll mail you a limited-edition Lucky Charms Marshmallow Only box (pictured right) in a few weeks after you enter the code. You can enter the code at MarshmallowOnly.com.